Lib Dem leader Nick Clegg claims the worst offenders in the MPs' expenses scandal are more likely to be sitting pretty in safe seats. Is he right? "Britain needs voting reform to abolish the safe seats that make MPs complacent - those in safe seats were three times as likely to be identified as having abused their expenses by The Daily Telegraph." The Lib Dem leader has not shied away for the expenses controversy, calling for the current audit of expenses by Thomas Legg to go further. 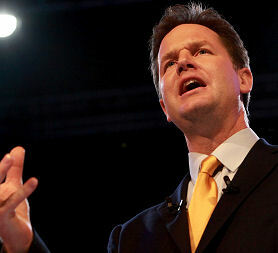 In a Daily Telegraph article, he tied the issue to voting reform, a subject close to the Lib Dems' heart. Those MPs in safe seats were, he said, three times as likely to be identified as having abused their expenses by The Daily Telegraph, which broke the scandal back in May. Clegg's citing some number-crunching by Mark Thompson, a Lib Dem blogger and activist, which has also been quoted by now-Culture Secretary Ben Bradshaw on Question Time, and Guardian columnist Polly Toynbee. Back in May, when each day brought more Telegraph revelations of MPs cooking the books, Thompson delved into how safe their seats were on his blog, Mark Reckons. He got a spreadsheet of all the MPs, listed by majority. He then noted all those who had been named by the Telegraph so far, according to a list on their website - a sample of 94. Thompson told FactCheck he wanted to be as non-partisan as possible, so included all MPs, rather than take a judgement on their alleged abuses. The only ones he excluded were a handful who had been held up in The Telegraph as good eggs - for example, the climate change secretary Ed Miliband and Luton MP Kelvin Hopkins, who were mentioned in the early Telegraph coverage in relation to their modest claims, aren't included in the sample. Thompson then ordered the MPs by the size of their majorities, and split them into four sections (quartiles). He found that 13 of the MPs entangled in The Telegraph's stories came in the bottom quartile - with the smallest majorities and the least safe seats. Nearly three times as many, 36, came in the top quartile, with the safest seats. It looks pretty convincing when you see the results - as plotted by Thompson - on this graph. But Thompson was careful to caveat his findings. He looked at the MPs who had been exposed by the Telegraph at time of writing - when the paper's investigations were still going on. He did another analysis when their revelations were pretty much at an end, and found that MPs in safe seats were still more likely to be implicated - although it was now to the tune of being twice as likely rather than three times as likely as those in a more precarious position. Arguably, this later figure was "diluted" by later and less serious stories, as the revelations started to run out of steam. But then, the earlier sample doesn't include some of the more notable claimants to feature in the Telegraph - such as Peter "duck house" Viggers and Ian Gibson, who stood down as an MP over the issue. Either way, we know that there is a correlation between the MPs who appeared in the Telegraph's revelations, and the safeness of their seats. But this doesn't prove that one causes the other. For example, the paper's initial splashes focused on the cabinet, followed by Labour ministers and the Tory front bench. It might seem logical that senior MPs are more likely to have been in parliament for longer, or to have been parachuted into safe seats - so would it be the case that the Telegraph's coverage would inevitably pick up a higher proportion of MPs in safe seats? We went through Thompson's spreadsheet again and totted up MPs on a non-expenses-related basis - whether they were members of the current cabinet (or ministers who attend cabinet), or Tory or Lib Dem front benchers. This gives a total of 79 MPs. 14 of these are in the bottom quartile - with the least safe seats. Almost twice as many - 27 - are in top quartile, with the most safe seats. If SNP leader Alex Salmond is included, it makes a round 28 in the top quartile. Either way, a similar correlation to that which Thompson got in his second analysis of The Telegraph's MPs. It gets much stronger if we just look at the two biggest parties, ignoring the 27 MPs on Lib Dems' front bench (a high proportion of their total of 63). Out of 52 MPs on the Labour or Tory front benches, just three are in the bottom quartile of the least safe seats. Nearly nine times as many, 26, are in the top quartile. This isn't particularly scientific. The current front benches aren't the same as they were back when the expenses scandal broke - remember those high-profile local election resignations from the likes of Hazel Blears and James Purnell? You might get a different result too if you included all the Labour ministers rather than just the top brasses who are in or attend cabinet, or if you widened it out to include select committee chairs. But it does illustrate that other factors are at play - so how important is the minister-factor in the make-up of the Telegraph's list? It's not the case that everyone included is a big name. Thompson told us there were a large number of MPs he hadn't heard of - and he's a self-confessed political anorak. Phantom mortgage claimants Elliot Morley and David Chaytor, both of whom were suspended from the Parliamentary Labour Party, weren't exactly big household names. Neither was Margaret Moran, she of the £22,500 dry rot bill, or Fabian Hamilton, or Stephen Crabb - all mentioned in the early Telegraph investigations. Clegg's claim is based on some fairly detailed analysis of a big tranche of MPs which made up the Telegraph's early expenses revelations, and found those in the top quartile of safe seats were three times as likely to feature as those in the bottom quartile. Re-doing the analysis at a later date, when the paper had covered more MPs, showed those with the biggest majorities were twice, rather than three times, as likely to feature as those with the smallest. Clegg implies that one factor causes the other, using the finding as a basis to call for reform of the first-past-the-post system which gives MPs such differing majorities. But doesn't necessarily stack up. A correlation between two factors does not mean that one causes the other, and it's also worth bearing in mind that top frontbenchers are more likely to have safe seats than MPs as a whole. Still, it's an intriguing piece of research - though perhaps one that we should be careful about stating as political fact without question. Every time a FactCheck article is published we'll give it a rating from zero to five. The lower end of the scale indicates that the claim in question largerly checks out, while the upper end of the scale suggests misrepresentation, exaggeration, a massaging of statistics and/or language. In the unlikely event that we award a 5 out of 5, our factcheckers have concluded that the claim under examination has absolutely no basis in fact. You've read the article, now have your say. We want to know your experiences and your views. We also want to know if there are any claims you want given the FactCheck treatment. FactCheck will correct significant errors in a timely manner. Readers should direct their enquiries to the editor at the email address above. Facebook Places goes live, will it change how we behave?